A truffle is a highly prized and wildly expensive species of mushroom, commonly used in European cuisine for its strong flavour. It can take years to cultivate and requires specific conditions to mature – such as a cool climate, high elevation and the right soil pH level and micro-organisms. But those with the right environment and patience stand to make a pretty buck from the fungi. In South Africa there are a handful of areas or micro-climate pockets that have proven to hold the correct cultivating conditions, and last year the country’s first commercially-produced black truffle was reportedly discovered on a plantation in Mpumalanga. The Western Cape also holds prime conditions with its cooler Mediterranean climate and soil composition, according to South African mycologist and farmer Leon Potgieter. He runs Truffle Growers SA, under the brand African Truffles, and has about 28 hectares of truffle orchards under cultivation, with a further 30 to be set up over the next two years in partnership with a European company. His truffle inoculations began around four years ago and Potgieter suspects they will be ready for harvest next year. 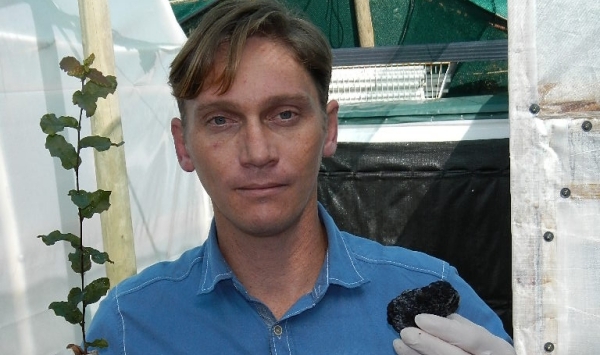 And, judging from past Australian export and sale values, he estimates that his South African-grown black winter truffles will sell for a whopping R22,000 (about US$1,648) per kilogram. Beyond its own production, Truffle Growers SA is also establishing a business around setting up truffle plantations for other South African farmers looking to break into the industry. The company’s services include site analysis, supplying inoculated truffle trees, setting up orchards, harvesting, quality control, and assisting with direct sales and exports. Potgieter said he has set up orchards on 12 farms already and expects this to increase as farmer education of the fungus grows alongside the local industry. 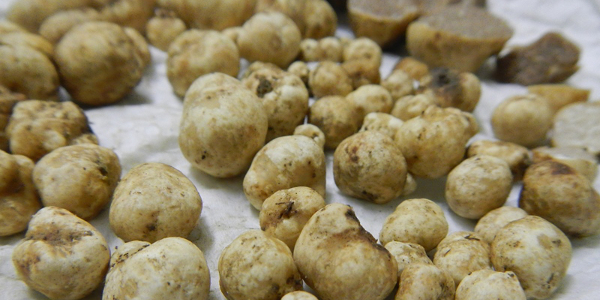 Despite the specific conditions required to grow truffles, he added that truffle production is a lucrative crop for farmers due to relatively low orchard maintenance costs. “It is easy to maintain. Establishment costs are low if you compare it with the amount of labour and infrastructure (including water) you would need to grow anything else. And it is also a low input crop,” he explained. Truffles are grown on the roots of host trees – typically oak, but also hazelnut, pecan-nut, cork and poplar trees – which Potgieter inoculates a couple of times, from seed to sapling, for eight to 12 months before it is ready to be transplanted into an orchard. South African mycologist and farmer Leon Potgieter has set up truffle orchards on 12 South African farms already and expects this to increase as more and more farmer are educated on truffle production. He added that often farmers want to grow the truffles on nut trees, with the hope of harvesting both nuts and the fungi. But due to the use of nutrient-deprived soil and lack of inputs such as fertiliser, Potgieter advises farmers to choose production of one over the other. “Decide whether you are growing truffles or nuts. Because while you will get some nuts [from truffle nut trees] they will be very far-stretched and limited in production – probably 10% of a real nut farmer’s harvest,” he explained, adding that nut trees also attract insects and animals. Once the inoculated tree has been transplanted into the orchard, it takes about five years for the tree to mature to the level that it can produce truffles, although this depends on the type of tree and its stage of development. Oak trees, explained Potgieter, tend to be slower growers than hazelnut and pecan-nut trees. When truffles have grown and are ready for harvest, they produce a pheromone that attracts animals. This is the same pheromone that male pigs emit, and for years female pigs have been used to locate mature truffles, highlighted Potgieter. Today there are training schools to prepare dogs to find truffles, which he believes will grow alongside the industry in South Africa. In addition to export potential, there is also demand locally. “From the Okavango belt to the restaurants in the Gauteng region, they are all looking for truffles because there are not enough available here. To export truffles from Europe to these restaurants just pushes up costs,” noted Potgieter. In addition, there is potential to process extracts into truffle-flavoured salt and oil. 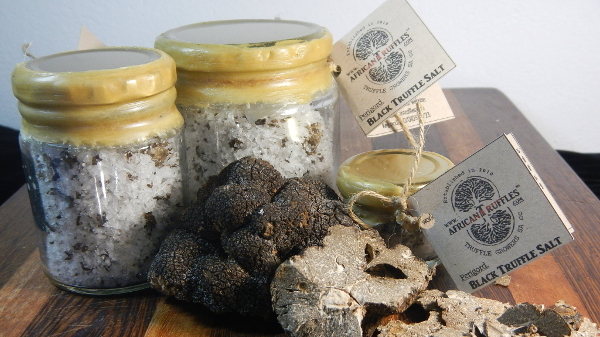 Truffle Growers SA is also producing its own truffle salt to supply the local market. Potgieter, who has been fascinated with mushroom production since he was a child, also believes he discovered the first Western Cape indigenous truffle six years ago and has been conducting research into its genealogy with his business partner and truffle expert, Dr Paul Thomas. A knock at the kitchen door. The chef answers and finds a neighbour holding a large basket of just-picked chanterelles. “Can you use them?” the forager asks. You’d be forgiven for thinking this an Alice Waters tale straight from California’s storied foodscape. In fact, it happened in Houston, says restaurateur Elouise Jones of Ouisie’s Table. Even if no one shows up at your door offering chanterelles, you probably have eaten plenty of Texas mushrooms. The two major growers, Kitchen Pride in Gonzales and Monterey Mushrooms in Madisonville, supply the state’s groceries, including Central Market, Fiesta, Foodtown, H-E-B, Kroger, Randalls, Tom Thumb and Wal-Mart, as well as white-tablecloth restaurants and some farmers markets. Both companies grow, in order of sales, button mushrooms, portobellos, cremini (also called Baby Bellas) and oyster mushrooms. Nonetheless, Texas’ mushroom industry barely registers on the national scene. Pennsylvania grows the most — either 61 percent or 45 percent of the nation’s supply, depending on which data you look at. California comes in second. The Texas industry is so small that statistics are unavailable. “We found the one thing Texas is not big in: mushrooms,” says USDA statistician Esmerelda Dickson. It’s apt that Jones’ neighbor-forager appeared and vanished mysteriously. Anybody who walks in the woods or strolls in a park after a rainfall knows that wild mushrooms seem to grow as if by magic. Now you don’t see them, now you do — a phenomenon so familiar it’s recognized in adage: to pop up like mushrooms, to mushroom in growth. This exalted picture is at odds with contemporary mushroom farms — large, drab buildings of concrete, corrugated metal and fluorescent lights. They look like factories and operate like laboratories, 24 hours a day, 360 days a year. Growers (the trade term is “industrial mycologist”) meticulously control sanitation, security, soil, spawn, carbon dioxide, oxygen, water, temperature, humidity, pests, pathogens and molds. Pickers wear hair and beard nets and gloves. They dip their shoes in disinfectant before entering long, dark warehouses where the mushrooms grow on trays stacked floor to ceiling. Air passes through HEPA filters. Clipboard charts document every droplet of water, every degree of cooling. The smell seesaws between earthy funk and detergent. By all accounts, mushrooms are sensitive, fastidious fungi, making their cultivation “a science and an art,” according to a sign at Kitchen Pride. The growing process takes three to four months from compost to market. Complex compost blends cottonseed meal and wheat stubble, eventually distributed among large trays, mixed with spawn (a lab-produced fungal culture) and, over the next few weeks, sampled and tested. If all goes well, the dark-chocolate soil is soon threaded with fine white filaments — mycelium — at which point the growers top each tray with peat moss. And wait. “Up until this point, the mushroom has been in a vegetative state,” explains David Nesselrode, general manager at Monterey. “If you see mushrooms pop up in a yard or around a tree, there is some trigger. You’ve had rain, a humidity change, a barometric-pressure change, a temperature change. What that mushroom has done is gone from a vegetative state to a reproductive state because it thinks it’s going to die. What we do is drop the CO2, the temperature, the humidity. We artificially ‘scare’ it. We do all three at one time, and it says, ‘Okay if I don’t reproduce, I’m going to die.’ Those little wispy fingers (mycelium) will start pulling together, and everywhere it pulls together, you’ll get a mushroom. Mushrooms, which emerge from the ground remarkably clean, are picked by hand; mechanical harvesting would damage them. Harvesters grab a handful, pull and twist gently, trim the stumps with a knife and distribute them among baskets according to size and grade. A good picker can harvest as many as 100 pounds an hour, says Phil McClain, who runs Kitchen Pride with his father and brother. To help preserve them, they are placed in a vacuum cooler, which lowers their temperature from 65 to 34 degrees in just 15 minutes; then they are sent to market. “What we pick today, we pack and ship tonight,” Nesselrode says. 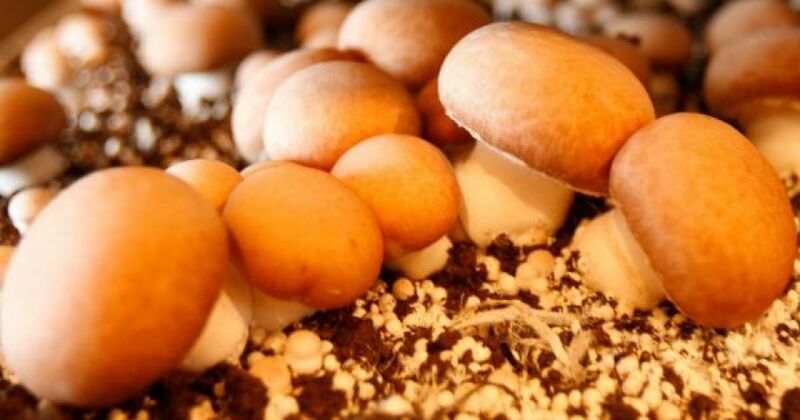 Computers, air-conditioning and patented laboratory spawn may be new, but the Chinese and Japanese have cultivated mushrooms for thousands of years. Ancient Greeks and Romans grew them, too. (Agrippina, the wife of the Emperor Claudius, is said to have poisoned him with a tainted mushroom.) Modern commercial cultivation dates to 17th-century France and parallels the development of the country’s sublime, mushroom-laden haute cuisine. The French raised mushrooms in abandoned limestone quarries, which sounds romantic, as French ways are wont to. For much of this period, American cooks, and eaters, missed out on the variously earthy, silken, meaty, delicate, intense, nutty, aromatic mushroom. Until just more than a century ago, we relegated them to ketchups, sauces and pickles. We were mycophagous (fungi-eaters), but barely. Then, in the 1890s, “a veritable fungus frenzy” suddenly swept the nation, writes Andrew Smith in The Oxford Companion to American Food and Drink. In nearby Huntsville, the Texas Mycological Society holds its Mushroom Foray, an event held every two years. If you ever intend to pick your own, take this chance to educate yourself. A mistake — sautéeing an Amanita phalloides instead of Volvariella volvacea, say, in a pat of melted butter and smidgen of pungent garlic — could be fatal. Or, as Van Metzler, co-author with Susan Metzler of A Field Guide: Texas Mushrooms, put it, “All mushrooms are edible. It’s just that some of them will kill you.” But get it right and you are in for a rare treat.